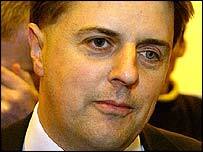 British National Party leader Nick Griffin has been charged with four race hate offences, police said. West Yorkshire Police confirmed that Mr Griffin, 45, of Welshpool, was charged at Halifax police station on Wednesday. He will appear at Leeds Magistrates' Court on Thursday accused of using words or behaviour intended or likely to stir up racial hatred. Earlier, founding chairman John Tyndall was charged with inciting racial hatred during a speech in Burnley last year. BNP activist Mark Collett, 24, has been charged with eight offences of inciting racial hatred. Mr Griffin's arrest followed a West Yorkshire Police inquiry after the BBC's The Secret Agent was aired last July. 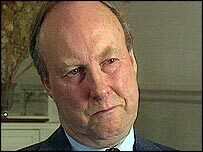 Mr Tyndall was arrested in December following a speech he made in March 2004. He was charged with two offences of using words or behaviour intended or likely to stir up racial hatred. An estimated 130 people draped in Union and St George flags had gathered outside the West Yorkshire police station on Wednesday. The BNP leader claimed after being released that his arrest had been "politically motivated". He told supporters he had been charged for telling the truth and would use any trial to defend his party's beliefs. Mr Tyndall, Mr Griffin and Mr Collett, of Leeds, are all due before Leeds magistrates on Thursday. A 47-year-old Harrogate man was released from bail last week and no further action will be taken against him, police added. Police had worked closely with the Crown Prosecution Service, a spokesman said.